Hearts of Hermosa, Hermosa Beach Schools’ largest fundraiser is coming up March 23rd, 2019. Tickets on sale THURSDAY, FEBRUARY 14, 2019. It’s sure to be an amazing night with many local food and beverage vendors, an auction, some March Madness viewing, and celebrity DJ Daisy O’Dell. Proceeds go directly to HBEF. Hermosa Beach Education Foundation (HBEF) is a volunteer organization dedicated to raising funds for the Hermosa Beach City School District. Our high performing distinguished schools require funding beyond what we receive from the state to maintain a standard of excellence. 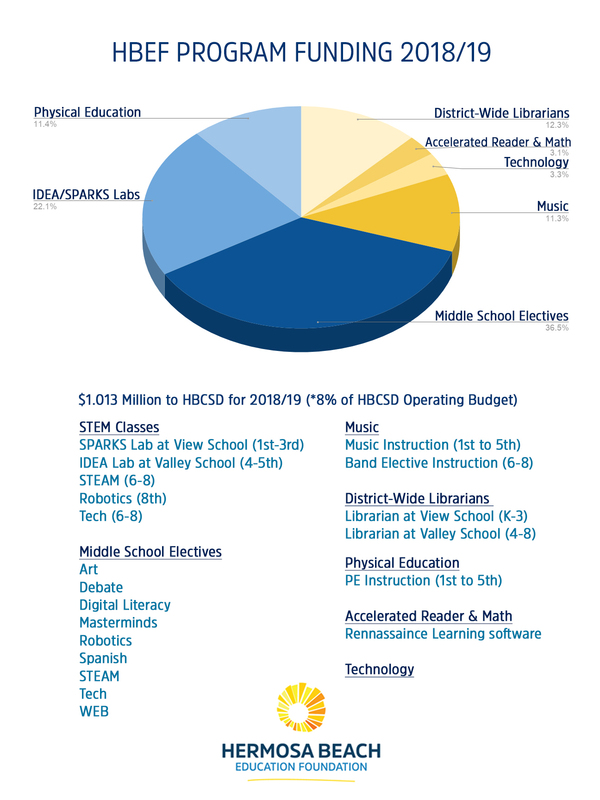 HBEF raises ~ $1 million+ each year to pay for critical programming in our schools — libraries, middle school electives, physical education, music, STEM, IDEA/Sparks Lab, technology, and more. The recommended donation of $1000/child makes a significant difference in our schools and helps bridge the gap between government funding and providing a high quality education to our students. Donations can be billed monthly, quarterly, or as a one-time payment.